...... Aries Video to PSP Converter can convert almost all video an audio formats, such as AVI, MPG, MP3, MP4, VOB, MOV, AAC, WMV, WMA, 3GP, 3G2, DV, AAC, M4A, etc. to PSP supported formats. With the function to trim and crop the video, you can specify the video to be converted. You can also change the video effect, like brightness, contrast, and volume. Advanced settings of the video and audio can be changed to fit the quality you desired. The program automatically detects the CPU on your computer and selects the most effective algorithm for fast conversion. Very friendly interface helps you complete the conversion quickly. 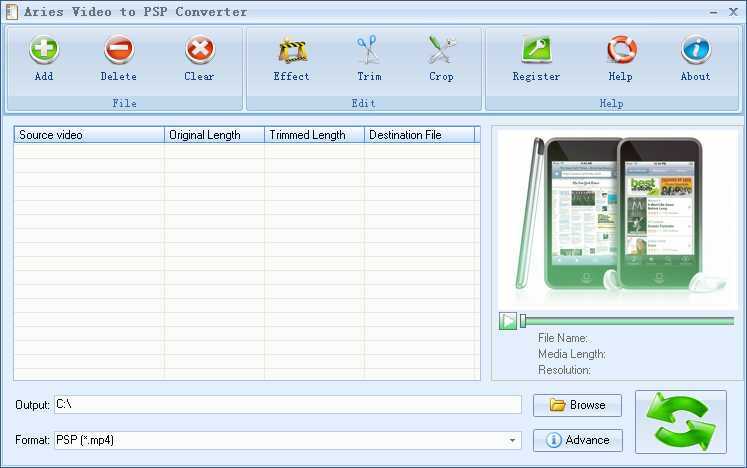 Convert video formats to PSP/AAC/M4A/MP3 clips and play them in PSP. Qweas is providing links to Aries Video to PSP Converter 3.0.1.324 as a courtesy, and makes no representations regarding Aries Video to PSP Converter or any other applications or any information related thereto. Any questions, complaints or claims regarding this application Aries Video to PSP Converter 3.0.1.324 must be directed to the appropriate software vendor. You may click the publisher link of Aries Video to PSP Converter on the top of this page to get more details about the vendor.